Comments: Comments Off on Gutless NFL suspends Rice for just 2 games. Gutless NFL suspends Rice for just 2 games. The NFL again showed it is gutless when it comes to violence against women. 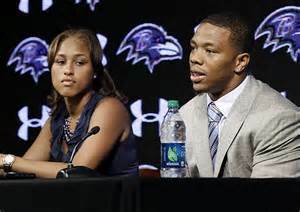 Despite video evidence that it has to have from the cassino of Ray Rice knocking his girl friend out cold, the league chose to suspend Rice for just 2 games. The video that was released to the public showed him dragging her unconscious body by the hair out of the building. This is an outrage. The minimum first violation for PEDs is 4 games. How can violence against a female be just 2 games? Frankly, this violation is far worse than than PEDs. If the NFL is honestly trying to get more female fans, it has to take this kind of physical assault much more seriously. But like the league’s stance on player safety, the words are mostly hollow.